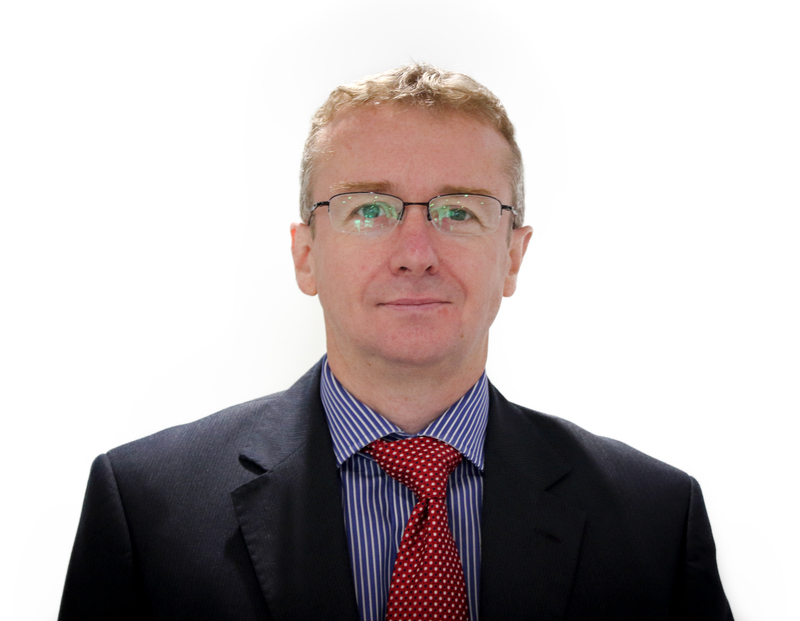 Iain Gould solicitor, explains what you need to know about deletion of records. deletion of records and data from national police systems obtained as a result of the arrest. Data held in police systems can include the record of arrest, fingerprints, DNA sample and custody photograph. This issue is particularly important for individuals who have no prior arrest history and who consider such retention of personal records with grave suspicion. (b)a DNA profile derived from a DNA sample taken as mentioned in paragraph (a)(i) or (ii). (b)the fingerprint was taken, or, in the case of a DNA profile, was derived from a sample taken, from a person in connection with that person’s arrest and the arrest was unlawful or based on mistaken identity. (3)In any other case, section 63D material must be destroyed unless it is retained under any power conferred by sections 63E to 63O (including those sections as applied by section 63P). (4)Section 63D material which ceases to be retained under a power mentioned in subsection (3) may continue to be retained under any other such power which applies to it. It is important to note the exceptions at points (3)-(5), and be aware that the PoFA does not deal with custody photographs (stored on the Custody Suite Imaging System, “CSIS”) and the associated police national computer (“PNC”) record and/or entry. As a result, unless an application is made under the Record Deletion Process (“RDP”), even if DNA and fingerprints are destroyed, the PNC records and custody photograph will be retained by the police until the subject is deemed to have reached 100 years of age. Irrespective of any complaint or civil claim pursued, the individual can apply for the destruction of all of his/ her personal data under the Record Deletion Process. Click on this link for guidance and the application form issued by the Association of Chief Police Officers Criminal Records Office (“ACRO”). Applications can be submitted to ACRO or the individual police force concerned. The applicant must state the grounds for having their records deleted and provide proof of identity/current address. The guidance suggests that the evidence and grounds for deleting records from national police systems will be then be examined by a chief officer. If agreed, the expectation is that any records held will be deleted. There are no set criteria for the deletion of records. Chief officers must exercise professional judgement based on the information available. Malicious/false allegation. When a case against an individual has been withdrawn at any stage, and there is corroborative evidence that the case was based on a malicious or false allegation. Proven alibi. Where there is corroborative evidence that the individual has a proven alibi and as a result she/he is eliminated from the enquiry after being arrested. Incorrect disposal. Where disposal options are found to have been administered incorrectly, and under the correct disposal there would be no power to retain the DNA profile. In such circumstances, consideration should be given to deleting records. Suspect status not clear at the time of arrest. Where an individual is arrested at the outset of enquiry, the distinction between the offender, victim and witness is not clear, and the individual is subsequently eliminated as a suspect. Judicial recommendation. If, in the course of court proceedings, a magistrate or judge makes a recommendation that an individual’s records should be deleted. No crime. Where it is established that a recordable crime has not been committed. For example, a sudden death when individual is arrested at the scene but after post-mortem it is determined that the deceased person died of natural causes and not homicide. 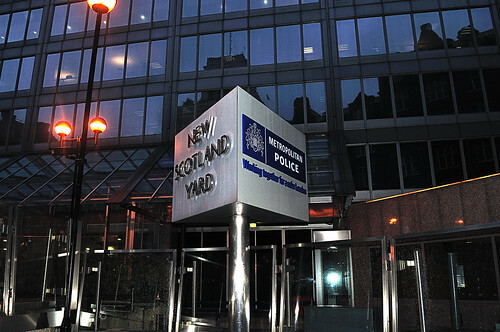 For deletion of records held by the country’s largest force, the Metropolitan Police (“the Met”), applications must be submitted to the Early Deletion Unit (“EDU”). It is not a straightforward process, as my client, Mr M, would confirm. Mr M (name withheld to preserve anonymity) was arrested on 31 July 2012. A month earlier an employee of Metropolitan Police was driving his car when he saw two individuals arguing in a car upfront. The female passenger allegedly slapped the male driver (Mr M) and in response he allegedly punched her in the face. At the next set of traffic lights, the Met employee parked in front of the car and got out to speak to the couple. He allegedly noted that the female, Mr M’s girlfriend, had injuries to her face and obtained their details. Several days later the Met employee submitted a report about the incident. Given the priority that domestic abuse is given, the case was investigated. there were a large number of people at the Met passing the matter around. During the investigation, Mr M’s girlfriend was contacted on a number of occasions. She denied that she had been assaulted and further, refused to lodge a formal complaint. Notwithstanding this, a decision was made to invite Mr M to attend a police station for voluntary interview a month after the incident. Upon arrival, despite attending as a volunteer, Mr M was summarily arrested. He was detained in custody for 3 1/2 hours during which time he was interviewed. 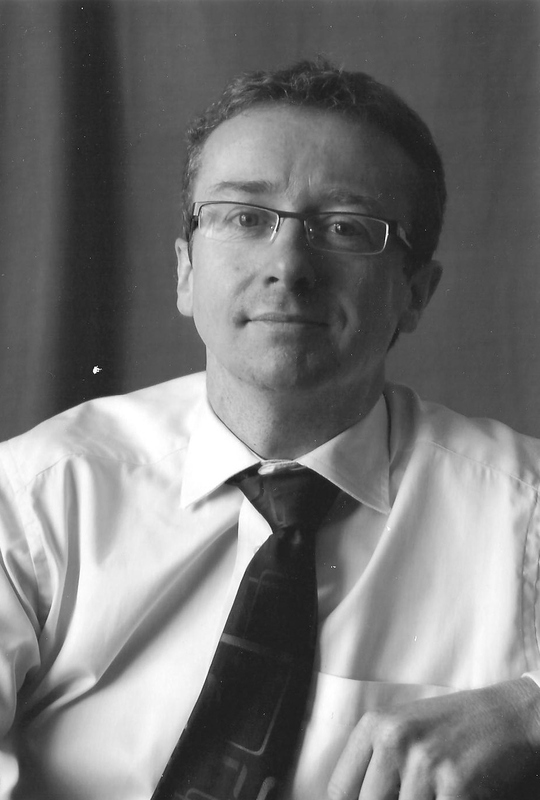 Mr M was then bailed to attend the police station on 4 September 2012 where he was again detained in custody for a further 4 hours during which time he was interviewed again. Ultimately, he was charged and bailed to attend court. Mr M pleaded not guilty and eventually the Crown Prosecution Service discontinued proceedings on the basis of insufficient evidence. Mr M searched the internet for guidance and, given my track record of success in this area, contacted me for legal help. My client’s priority, as a man of exemplary character, was the destruction of all personal data held. He also sought compensation for his false arrest, detention, and the stress of court proceedings. Mr M could have lodged an Application to the EDU shortly after the Crown Prosecution Service decided to discontinue proceedings. On my advice, he delayed, because, I advised, a complaint about the police’s conduct should come first. After discussing the case, I explained to Mr M that he did not have grounds to complain with the Met’s decision to investigate. I submitted a complaint against the Metropolitan Police on Mr M’s behalf and agreed to act in his civil action against the police for compensation. As is often the case, the complaint was dismissed by the Metropolitan Police. On my client’s behalf I appealed to the Independent Police Complaints Commission (“IPCC”). Following review, Mr M’s complaint was upheld by the IPCC. This mattered because the legality of arrest was initially considered by the Met’s “Professional Standards Champion”. As they initially dismissed my client’s complaint I am sure that the application for deletion of records would also have been rejected. Despite the IPCC’s positive findings its decision was not binding upon the police. As a result, when I submitted Mr M’s compensation claim to the police citing wrongful arrest, the Metropolitan Police denied liability. In the circumstances, I had no alternative but to issue court proceedings to seek justice for my client. Although liability was disputed, solicitors on behalf of the Met offered to settle his claim out of court. This confirmed my view that Mr M’s claim was entirely justified, despite the Met’s formal denial. After extensive negotiations, Mr M settled his compensation claim for £6500 plus legal costs. Despite this, in previous negotiations with the Met, it has been made clear that destruction of personal data has no relevance to any civil claim and that a separate application must be lodged to the EDU. I used the supportive decision of the IPCC and offer of settlement to persuade the chief officer to agree to the deletion of my client’s records. You would think that it would be a relatively quick and easy task to delete records. After all, they were easy enough to create when Mr M was arrested. Not so. My application to delete his records was acknowledged in mid-January 2015. 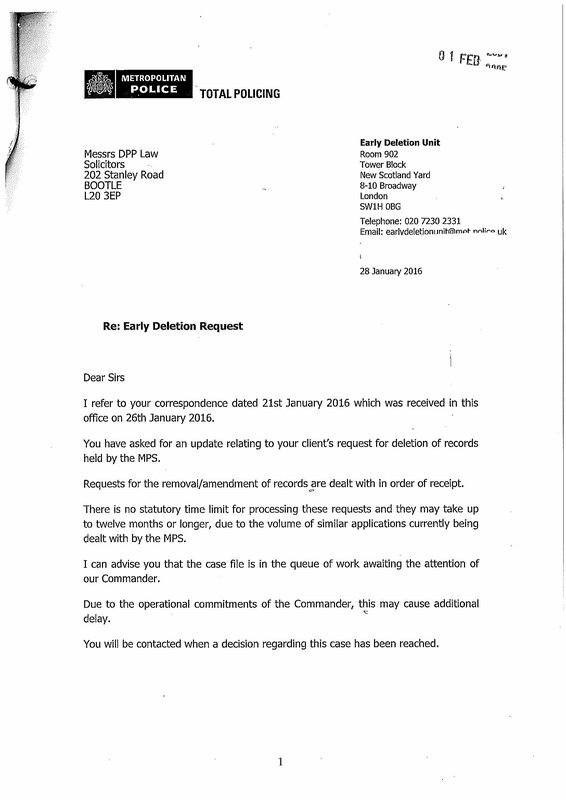 As is standard, the (laughably misnamed) Early Deletion Unit advised that it would take “up to 12 months” for a decision about deletion to be reached. Notwithstanding several reminders, no decision was made by mid-January 2016. The EDU advised that “there is no statutory time limit for processing these requests and they may take up to 12 months or longer, due to the volume of similar applications currently being dealt with by the MPS”. Redacted letter from the Metropolitan Police’s Early Deletion Unit confirming that requests may take up to 12 months or longer. You may wonder how many requests are processed at the EDU. 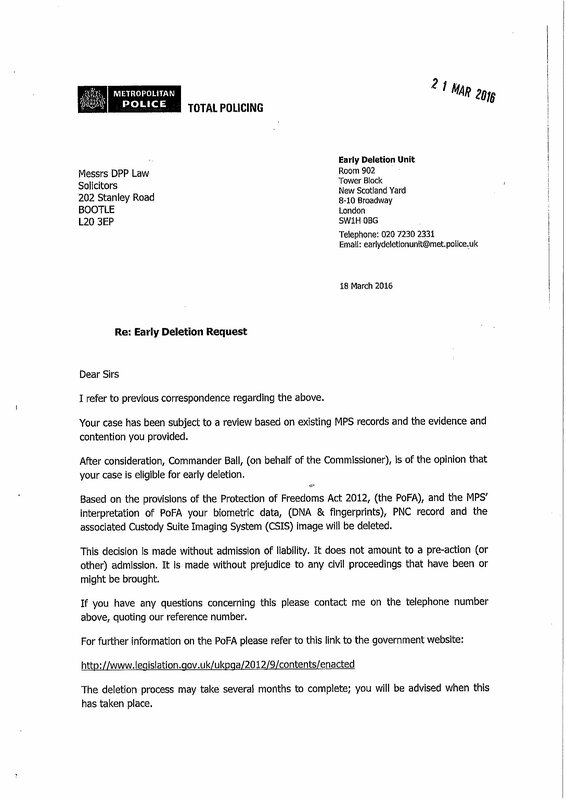 In response to a recent Freedom of Information Act request, the Metropolitan Police said that they were unable to provide this information because, remarkably, “This information is not recorded in a searchable electronic format”. In any event, I am pleased to confirm that the EDU did eventually process Mr M’s application. In mid-March 2016, the EDU ironically advised that the case was “eligible for early deletion”. And you might think that now that a decision has been made, the offensive data would be deleted forthwith. But no, the EDU advise that “the deletion process may take several months to complete”. Letter from the Early Deletion Unit confirming that Mr M’s case was “eligible for early deletion”. Despite this, my client is extremely pleased. His arrest has been recognised by an independent body as unlawful, he has received financial compensation for his unlawful detention, but most importantly, ALL personal data obtained as a result of his arrest has been (or will be) destroyed. His case proves that deletion of records from national police systems is possible, but it takes perseverance and knowledge of the system. 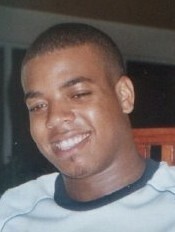 Contact me for help with your actions against the police using the online form below or at www.dpp-law.com. Will the Metropolitan Police Abuse their Body Cameras? I was interviewed on BBC Radio 5Live today about the Metropolitan Police’s decision to pilot a scheme in which 500 front line officers will wear body cameras. There is considerable debate about the use of body cameras, which is not surprising given that the trial, if extended, will ultimately result in 10,000 to 20,000 Metropolitan Police officers using the cameras, with many more around the UK following suit. In my opinion, such cameras have the potential to be crucial in re-establishing public confidence in the police. They can help members of the public in their fight against police misconduct and at the same time help the police reduce the number of complaints and police abuse claims made against them. But the Metropolitan Police Commissioner, Sir Bernard Hogan-Howe, has said that such cameras will not be permanently switched on and that officers will be able to turn them on and off as they choose. If this is allowed the body cameras’ role in providing a much-needed check and balance against abuse of police powers will be lost. Police officer wearing a body camera. Many reasons why continuous recording will never happen have been put forward (Human Rights, employment regulations, and so on) but unless the deployment of such cameras is not subject to stringent guidelines, their effectiveness will be limited. I would suggest a mandatory rule that such cameras must be turned on during any interaction with the public. If an officer fails to do so, not only should disciplinary action be taken when it is established that the camera was not deployed, but any footage obtained should be excluded from being used as evidence. This would have the desired effect of putting pressure on the police officers on the beat (and their superiors) to ensure that the cameras are routinely used. As with any new habit, a ‘carrot and stick’ approach would help. 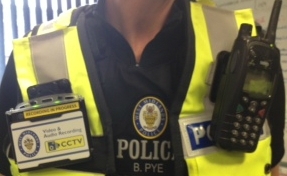 The ‘carrot’ is ensuring that the difficult job of being a front line police officer is supported by impartial and contemporary evidence from a video camera. The ‘stick’ reminder of the threat of disciplinary action or a failed prosecution will help to ensure compliance. Political motive for body cameras? Unless and until such guidance is issued, the deployment of these cameras is little more than a political quick fix to try to restore public confidence. What is really required is a change of culture where all police forces adopt a robust complaints system that is open and transparent and where police officers are held to account. The use of body cameras would go some way to providing the transparency required, but without a system of continuous use when interacting with the public, the Metropolitan Police’s motives could be seen as suspiciously self-serving. 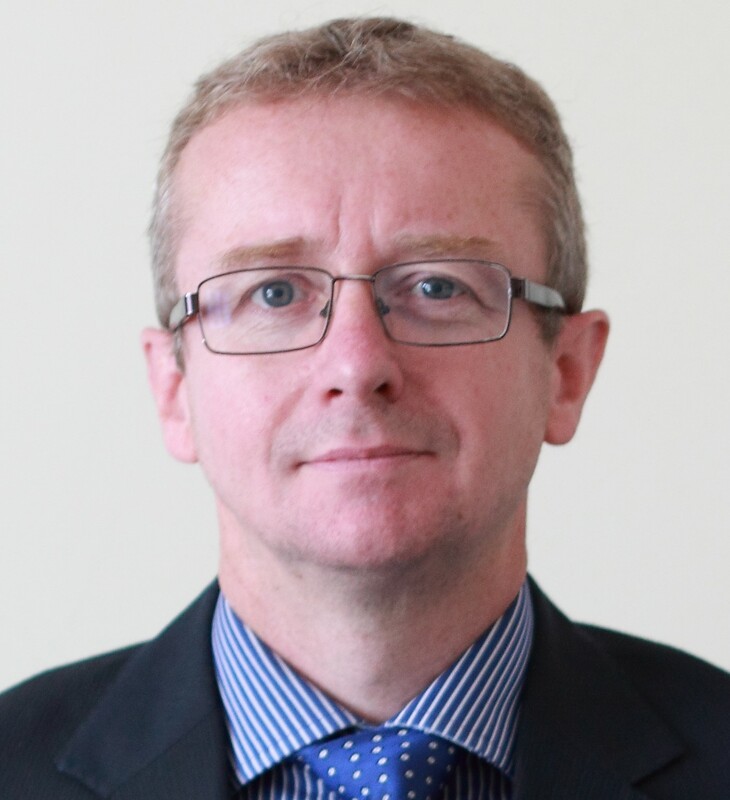 If you have a police abuse claim and want legal help, contact me, Iain Gould, using the online form below, on 0151 933 5525, or via my firm’s website. Image credit: West Midlands Police on flickr. Why must Court Proceedings be issued in a Compensation Claim Against the Police? Sometimes I get frustrated when helping my clients bring a compensation claim against the police. What appears to be a perfectly straightforward case against the police where compensation should be paid can often result in a hard-fought battle. When this happens I have no alternative but to issue court proceedings and fight for my clients all the way to a Court hearing. This is expensive, time-consuming, and stressful for all involved, including the police officers themselves who, like my clients, must endure cross-examination at Court. I had to take another compensation claim against the police to trial last week because the Metropolitan Police refused to settle. My client, Luke Appleyard, 21, a student at the University of London, will shortly receive £13,250 from the Metropolitan Police after being attacked by a police dog. So, taking his compensation claim against the police all the way to a jury trial was worthwhile. But was it really necessary? Shortly after midnight on Friday 9 October 2009, Luke (pictured and details used with permission), of Carshalton, Surrey, was walking with a friend through Carshalton Park. The park was dark and quiet. Suddenly, an Alsatian dog appeared running quickly towards them. Without warning, the dog jumped up and bit Luke on his right forearm, which he had instinctively raised to protect his face. The dog hung on for what Luke estimates was three minutes before Metropolitan Police officers arrived and released it. 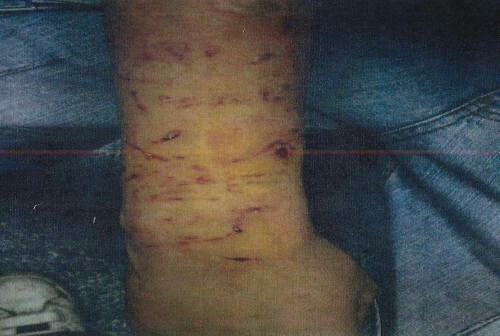 Luke’s arm (shown below after the wounds had been cleaned) was bleeding heavily but the police insisted on searching him before getting medical help. Luke Appleyard’s arm after the police dog attack. He was later told that the dog had been set on him as a result of mistaken identity, and that the police were searching for two robbery suspects. Mr. Appleyard was taken by ambulance to hospital where his bite wounds were treated. He has since been left with about 20 scars on his right arm which makes him uncomfortable wearing short sleeves in public. lost confidence in the police. As he received no apology or offer of compensation from the police, he decided to take matters further. He found my details online and asked me to represent him in his compensation claim against the police. After discussing it with him, I decided to take his claim. 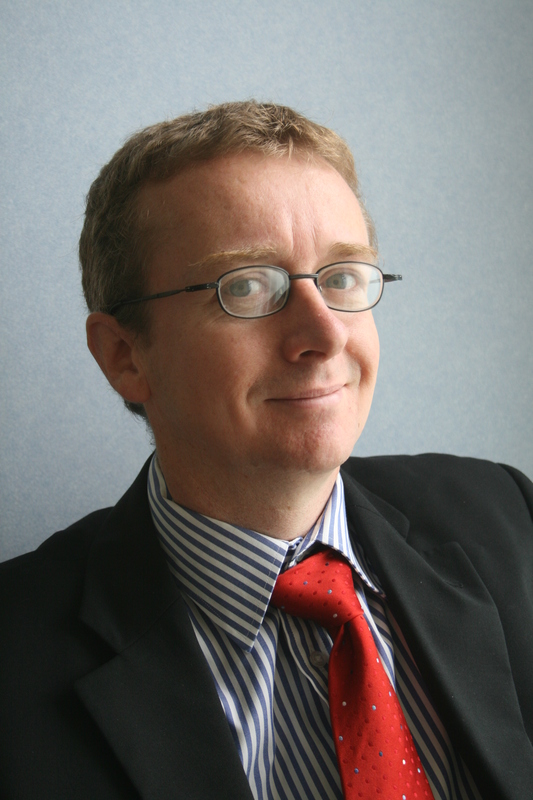 I initially represented Luke as a legal aid lawyer but later, when funding was withdrawn, acted on a ‘no win no fee’ basis. I submitted details of Luke’s claim but the Metropolitan Police denied liability, saying that the police dog handler acted within the police’s guidelines when deploying the dog, ‘Storm’. They claimed that Luke was running away, that the officer shouted a warning before releasing Storm, and that the force used was reasonable and necessary. As this was a very different version of events to the one Luke had told me, I had no alternative but to take Luke’s compensation claim against the police to a full jury trial. On Wednesday 11 December, at the conclusion of the three-day trial at the Central London Civil Justice Centre, the jury returned a verdict indicating that they did not believe the Metropolitan Police officers’ account. I had seen the police officer’s statement long before the trial and was sure that this was impossible. Manchester United’s football pitch is 105 metres from goal to goal. View of Manchester United’s football pitch. The officer claimed that he could see further than that distance in the dark and positively identify Luke and his friend as the people they were searching for. The jury disagreed with the police’s version of events. They were not satisfied that Luke and his friend were running, or that the decision to release Storm was necessary or reasonable. Instead of apologising and offering fair compensation, the Metropolitan Police fought Luke’s genuine claim so that he had no alternative but to go to an expensive, and unnecessary, jury trial. The legal costs on both sides in Luke’s case will be many times more than the compensation he is paid. Because he won, all costs will be paid by the Metropolitan Police, who in turn are funded by taxpayers. At a time when the Metropolitan Police’s funding is being closely examined, I hope those responsible will think long and hard about their conduct. If you want to make a compensation claim against the police contact me, Iain Gould, using the online form below, on 0151 933 5525, or via my firm’s website.